I am always very honest about the hotels I visit. Calas Park is in a lovely position and the views from the majority of the apartments are stunning. The rooms are a good size - shame about the single beds in the double rooms and the sofas for the kids to sleep on which are in the living area and are a little small (but my daughter (17) is very tall, but apart from that they are clean and towels changed regularly. The staff are brilliant especially Victor and Paticia in the bar, the rest will take the time with you if you bother to talk to them - something that some people don't bother to do. The pool is a little small and so very cold with no life guard and if you want a sunbed beware they were being reserved before people went to bed! There are many English there but it can be quite German dominated at times and one of the entertainment team did like to play the English and Germans off against each other. The food was very repetitive and this is the only time I have had stomach upsets and felt nauseous after eating. Once we did have to throw my sons food away as the ham was clearly off and smelt bad, we did tell the staff they did nothing. The entertainment to start with was dire! There were only two of them and Chris the main entertainer was at times rude and had no idea. Anna was lovely and tried so hard and by the end of our two weeks had improved greatly. Sometimes the entertainment finished at 10pm and this left you with little to do. We were asked to do a questionnaire 4 nights into the holiday and found that by being honest the entertainment did improve. Outside the complex there are many shops and bars, I would recommend Bar Mambo who have buy one get one free on all drinks all day and there is a great Chinese next door! I would also highly recommend O'Donnells bar next to Calas Park this is brilliant and a great laugh with great staff. The beach was a five minute walk and was breathtaking worth a visit. Would I go again, probably but the food does need to improve. Like many people I will trawl the reviews before booking and will always endeavour to leave an honest, ball-balanced opinion after holidaying. Firstly, this isn't an 'hotel' in the true sense of the word, it is an apart-hotel; whether this has ever been merely an apartment complex is more than likely given that the rooms still sport a fridge and electric hob! I think that the 3 star rating is overly flattering, especially as the neighbouring Samao Hotel is also 3 star and, having stayed there last year you cannot compare the two. Regardless of the age etc of the Calas, the rooms and common areas are kept clean, sadly you cannot say the same about the pool, which is disgusting in parts where drinks have been spilled and left to become sticky; in the week I have just spent there I do not recall seeing the pool area being cleaned at all. The food was 'acceptable' and albeit somewhat repetitive, there was always a good variety to choose from and, if you bother to ask, the staff will accommodate you. For instance, I don't like garlic but love liver; when the menu had liver on the other day, the chef was only to happy to cook some for me that didn't contain garlic and even went so far as to cook me some onions to accompany the liver! The main problem with the food is that the restaurant is housed outside of the accommodation area instead of inside as with normal hotels. Also, although 'snacks' are advertised, you cannot take food from the restaurant to eat at the pool so it is pretty pointless; furthermore the snacks tend to consist of what wasn't eaten at the previous mealtimes and not the normal snacks you expect to see like burger, hotdogs etc. The Calas is in a good location and the beach and shopping centre are minutes walks away. A word of caution for the elderly, infirm or families with young children; the hotel boasts in excess of 70 steps from the pool to the reception and the ramp at the side is seriously steep, as are the steps. I wouldn't recommend it for anyone with mobility problems or kids in buggies. The staff are generally pretty good and yes, they speak a lot of Spanish but it's Spain so get on with it. If you bother to learn something of their language, even if it's hello and thank you it goes a long way. The most damning problem with the Calas is the entertainment, it is absolutely awful. The 'live' shows that we witnessed were something that you might have expected to see in Benidorm in the 60's; if the hotel think that this is what people want to endure then they need a wake-up call. I wouldn't visit the Calas again; it's old, has had it's day and needs to spend some of it's visitors money on entertaining them, certainly the children, in a better manner. You get what you pay for at the Calas; I don't expect 5 star amenities when I pay for a 3 star holiday but when you have visited other 3 stars that outstrip this in every department, you can be forgiven for expecting better than we have had in the last 7 days. We've just returned from a two week stay all inclusive at this hotel, we have two boys aged 11&7. CLEANLINESS: spot on! Cleaners everywhere each morning, mopping, sweeping etc. Rooms cleaned & towels changed everyday except Wed & Sat. FOOD: Hit & miss, breakfast was poor, rubbish sausage, bacon only few times a week, cold beans. Stale soggy cereals. Other meals fine, lots of salad, veg, potatoes, meat, fish, pasta, pizza, chips. Baguettes were lovely & fresh. Lots to choose from and not too repetitive. Our kids never went hungry and our youngest can be fussy.Good for a 3 star we thought from past experience. DRINKS: Great! Soft drinks self service, so no queuing for the kids. They had fizzy/still drinks, milkshake & slushes. Wine, spirits and beer available from the bar, we went in main weeks and there were hardly any queues. LOCATION: Brilliant! As long as you are able to climb steps everyday to get to the restaurant,pool and beach this hotel is perfect. 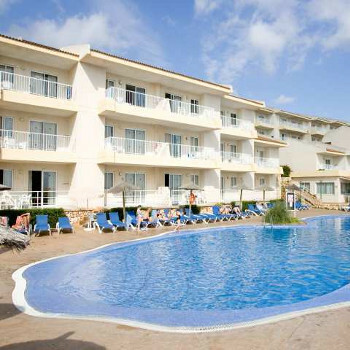 It overlooks the sea and is only 5mins walk from the beach and shops/bars. It catches a light sea breeze around the pool area which is very nice when the temp is 30+ degrees. STAFF: Very friendly & helpful. Entertainment staff did their best. Cleaners were polite & pleasant, as were bar staff and waiters. ENTERTAINMENT: Poor. If the alcohol wasn't free you'd happily go out every night! The entertainment staff did their best, but it wasn't enough. Bingo & kids club EVERY night got tedious after 2 weeks! Professional shows are few & far between & they're rubbish when you do get one! Parrot show was the best, but we've seen loads of times before. OVERALL: We'd give hotel 3/5. Just remember that this is a 3 star and 3 star is what you get here. PS: Germans are a plenty, but they don't spoil your time here as long as you don't let them. There are lots all over the island, not just this resort. Get up early for your sunbed! we had good time apart from the hotel being full of Germans. hotel catered mainly for them not much good for English families.ok we didnt go hungry but had to survive mainly on chips,salad and crusty bread.breakfast was ok some of the time,but it was just luck of the draw was was to eat rest of the meals, snacks on night time were always cold aswell. staff were lovely,entertainment was crap as staff done most of it,was not their fault though they did try (bless them).most of the entertainment was aimed at the Germans aswell.for the English NOT GOOD.the only good thing was you didnt have to queue up for icecream or drinks for the children the only thing you had to queue for was alcohol but there was never any long queues. the rooms were spot on nice and big and air con was brill.rooms cleaned every day and clean towels left.BEWARE if you are lukcy enough to be an early riser try and get down to pool for sunbed as the Germans are up at crack off dawn to make sure they get one and they are not bothered about taking ones that have towels on either or if you have a sunshade they will just take it. the beach was just a little walk from hotel it was lovely little beach well worth going just to be free of the Germans.was not to much to do for kids either all they seemed to do was paint t-shirts and had mini disco on for about half hour on night and that was it. We arrived at this Hotel on its last week before closing for the season....a strange experience !! We are Club La costa owners so are used to 4/5 star accomodation and booked this as a last minute extra break. We have been on several all inc and we got what we expected for a 3 star. The room was a nice surprise with a seperate bedroom [our last All inc ended up with 4 beds in 1 room]it was clean and had a great shower [hot/powerful]clean towels nearly every day if you wanted. Hotel was a bit tired looking although very clean. Food was not great but again adequate and very repetative even for the 8 nights we stayed. Location is super......close to the beach, excellant views from poolside area and close to shops and bars. All the staff were superb and friendly and would chat away. Entertainment was poor but again this was down to the end of season.........by the Thursday night there was no entertainment of any sort as the poor guy was made to start packing the stuff away by order of management. Overall we enjoyed our stay and as it was a last minute deal we got what we paid for. I don't think I would come in high season as it would be too busy but it was enjoyable enough. It was strange being in a hotel which was closing down for the winter.........by midweek the pool bar was closed.......by Thursday night the entertainment was finished...........by Friday the food choice was dwindling..........by saturday the bar held only a handfull of guests ...........and by Sunday night [our last one] we spent it sharing drinks with the receptionist and the entertainment manager in the hotel foyer ..........and enjoyed it all. One thing though...........even though the hotel was winding down we were never once refused a drink at the bar or told that nothing was available. We went to the above hotel on a all inclusive deal i hate to say but a massive mistake the food was absolutely disgusting it was cold and had to be reheated in microwaves and the meat was what a butcher would throw away, after 4 days we'd had enough and decided to eat out and it was not cheap but anything for a decent munch. There is a rake of steps so to us with a 1 year old in a pram it was murder. The pool was not the best and separating the kids pool to the deep end was a piece of rope which did no good. It wont be very long before there is a serious accident especially being no life guards. The only plus side was the kids entertainer a German lass called Ina she was great and kept them well occupied, the adult entertainer was not to bad in my eyes but a lot of people found him arrogant and very competitive.. The food was ok to begin with but after 2 days it was constantly repeated and often cold, I didn't think there was a very big choice compared to other hotels we have stayed in. Hotel location was excellent, overlooking the sea and close to the beach,and in the small town with plenty of shops. Hotel staff were quite friendly, especially in reception. The entertainment was naff, we were there for 10 days and only saw 3 shows and they were rubbish. But Ina and Souel the entertainment staff did work very hard from morning till night and it wasn't their fault the management would not pay for shows. The other downfall is all the steps on the complex, it didn't get any easier as the hol went on. The quality of the food was terrible, especially during the evenings, where swarms of tiny flies would gather. I have been advised by Envirnomental Health that this is how I contracted the Cryptosporidiosis parasite or alternatively from the pool itself. The pool was in a diabolical state, with broken tiles on the floor and no indication of where the underwater steps were, untill you tripped over them. I lost count of the number of children who fell and injured themselves on the slippery pool surface when vacating the water. The state around the pool was disgusting, plastic cups, fag ends, crisp packets were there until the evening when the pool closed and then they cleaned the area down. We have just recently returned from the Calas Park. The apartments were great, and we had a lovely sea view from our balcony. There are however alot of steps from the pool area to the restaurant - there are no lifts! The pool was nice & clean. The childrens pool was adequate, but the big pool was small, and there wasn't enough room to swim. We enjoyed the food, which was of high standard for a 3 star hotel. Lovely beach only 5 mins walk away. What can I say what a great holiday we had, so much so that we are goning back next year. The Hotel has the best location in the resort, over looking the sea, the beach 5 mins walk and the town on your door step. Although the Town is fairly small there are ample restaurants, bars,shops and kids entertainment eg. go-cart racing, trampleining, arcades, childrens bungy jump the list goes on. The Hotel was clean, rooms were cleaned 3 times per week, bedding chaged once a week. Friendly staff and entertainment great for the kids by the animation team Mateo and Alex who were superb. Had fantastic apt requested block 1, 1st floor, sea wiew and got exactley what we wanted. The view over the pool/sea was unbelievable.